4 Brushes: This Facial Cleansing Brush set has four brushes to satisfy your various cleaning requirements. Multiple Uses: Large Brush Peels and cleanses the skin of hands and body. Facial Brushes Peels and cleanses the facial skin. Sponge nourishes the facial skin. Pumice stone sweep skin clean of dulling flakes, such as elbows, knees, soles. Deep Cleansing With 360° Rotating: Remove dirt and grease in the pores. The rotate speed of our facial cleansing brush is the optimal setting for the best skin cleansing effect. Avoids skin damages yet cleanses skin thoroughly.Suitable for all skin types. Non-slip Handle: Improve grip friction to prevent slippage. 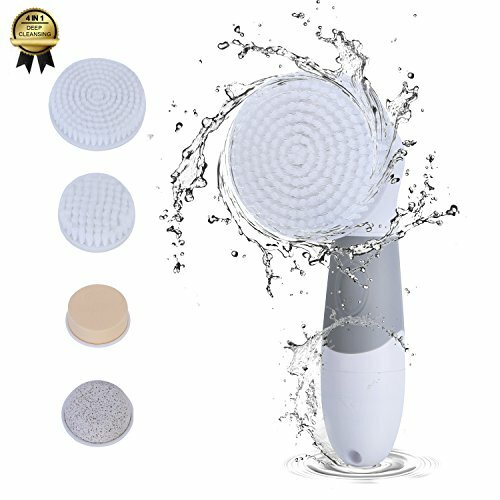 You can hold the facial brush firmly even in the wet. Waterproof Design: Waterproof design, you can use our facial cleansing brush in the shower.